The extreme wet weather conditions suddenly stopped just before Christmas only to be replaced by weeks of extreme frost (a severe -8 C at night and even sometimes 0 C at daytime). These days we have an extra wind-chill factor added by our weather men to make sure we don't zap away. Me, ha, who was produced in 1963, know of course what real winters are like. Time to go out. The relatively unknown and unvisited Berwyn mountain range was set as our target this time. The route took us not just up the normal easy way for wimps, but straight up the famous east-face of Cadair Berwyn (827 m). Only for the totally defrosted faintheartetets..... the what ? 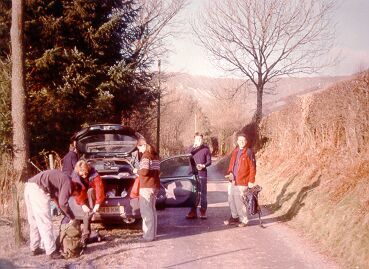 To undertake such an extreme expedition we needed at least our Southern expert who used a black expedition BMW which had replace the smaller Fiat Jesus (see October 2000). Further we needed the spiritual guidance of El Geoffrey, his foreign and Australian girlfriend to suppress his energy somewhat, our French tour guide for the risky bits, our Shrewsbury detachment for the sound effects, an x-ray specialist for advise on exposure and mud collection and myself to pass this invaluable experience with the rest of the wuh-wuh-wuh. We parked the cars at Tyn-y-Ffridd farm and walked up the valley of the lost forest. Lost forest, I hear you think? The Ordnance Survey maps say : Forest and there was no forest what so ever. The more educated readers among us will ask "What makes a forest disappear?". 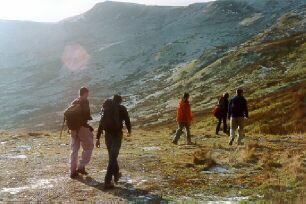 We have all heard of migrating Wilderbeasts but the trek of the Welsh pine forest is relatively undocumented. At the foot of the Berwyn cliffs you will find the rarely advertised Berwyn very-open-air museum, which displays a variety of disused mining gadgets, which the modern mobile phone carrying generation struggles to understand how it ever could have worked. Especially the cable cart without cable (see picture). We could see a top station and a bottom station but nothing to carry the load down. Did they use an advanced form of telepathy which is now lost to this age? Did they use sledges and move the stuff they mined only down in the winter? You see that archeology can be a difficult science and should only be practised by the more intelligent examples of mankind. We climbed to the entrance of the mine and enjoyed for a short time the beautiful ice stalactites, until the more destructive minds took over. 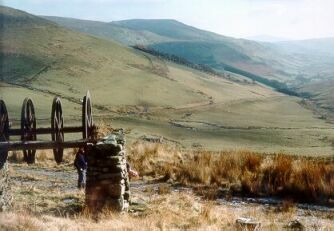 From this spot we challenged Cadair Berwyn. Since it did not reply to us, so we went up straight to the snowy top without further asking. After a beautiful lunch with a very tasty view we went sliding on one of the shallow lakes. El Geoffrey was found sliding on his belly and he tried to convince us that it was intentional.... ha. We followed the ridges Northwards over the tops of Tomle (the Mire) and Foel Wen (white bare hill) and then to Mynnydd Tarw (Bull Mountain) until we were right above the cars, and that seemed to be a good time to down. Slightly dispersed we arrived by the cars, which gave some us time for a cigarette. Time for the Last Inn you would think, but we first concurred at the Cross Keys in Selattyn. After the usual pint of Guinness the writer of this story got over confident and invited the party to his house just across the road for pancakes. Knowing that his wife does not like them, he let himself being overruled, and a more sophisticated meal was created with the help of some BWM assisted emergency shopping. And so it turned into a nice day after all.